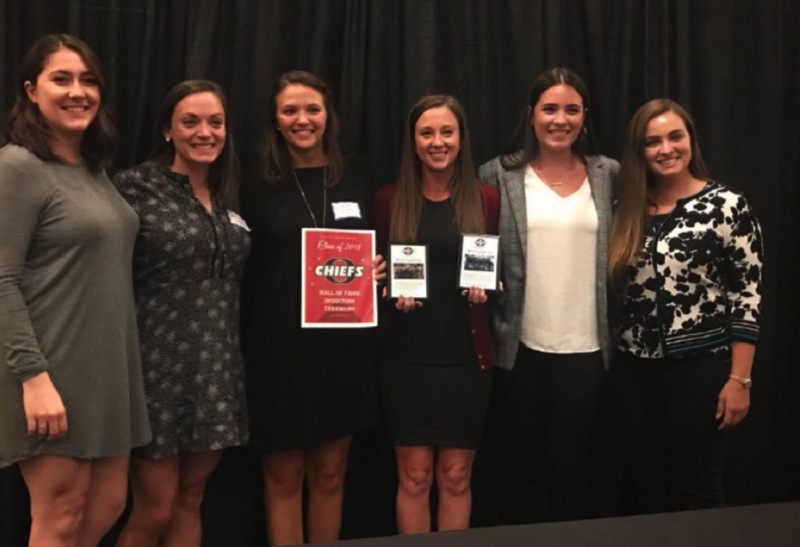 A decade ago, the Chieftains girls lacrosse team knew they had potential. Little did they realize their play would define success for prep lacrosse in the state of Michigan. OKEMOS, Mich. – The Okemos High girls’ lacrosse team thought it’d be an easy road back to the State finals in 2007, after suffering a tough loss in the regional final. The players were partially correct, as they went on become more than state champions. The Okemos team would go on to set Michigan girls’ lacrosse history, as standing behind the girls was a coach who knew the sport well and parents who would do anything for their daughters to succeed. Okemos girls’ lacrosse teammates at Okemos HS Athletics HOF ceremony. 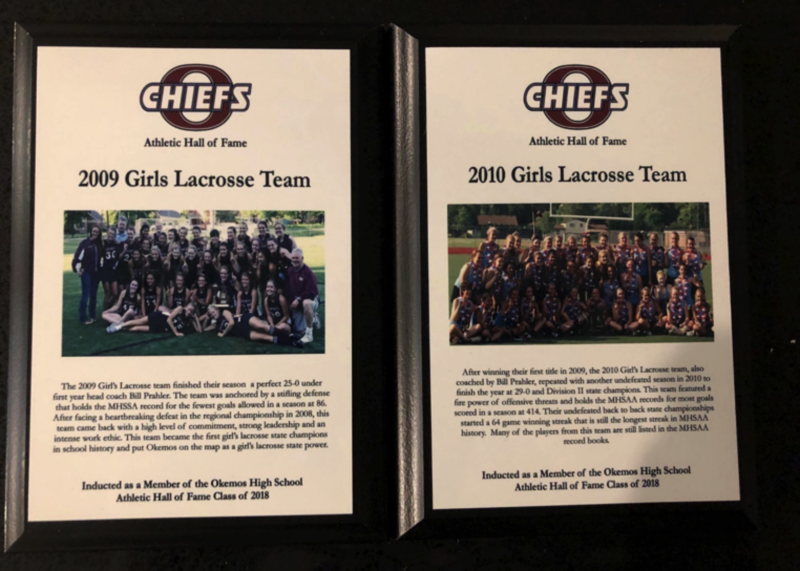 In 2009 and 2010, the Okemos girls’ lacrosse team won back-to-back state championships, set all-time MHSAA records, and remained undefeated for two seasons. 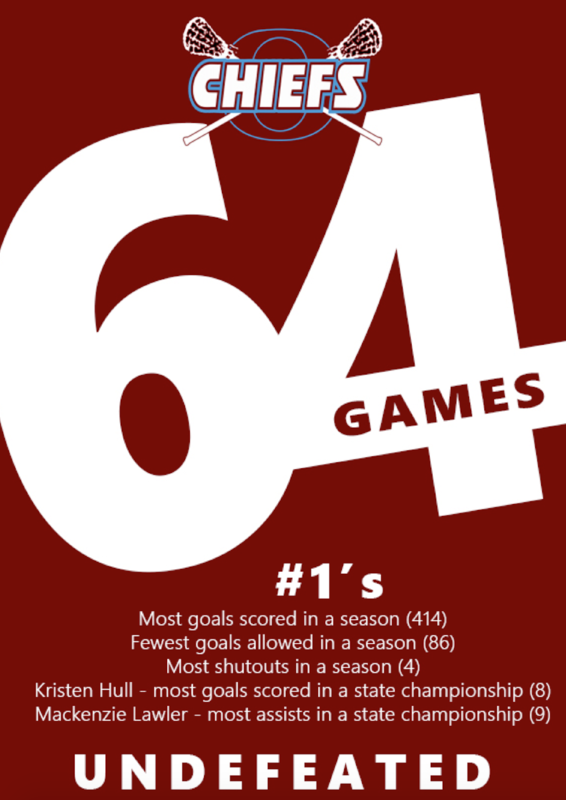 The team has the longest winning streak in Michigan girl’s lacrosse history with 64 games. Okemos High school recognized the team in late September, inducting into the Okemos High School Athletics Hall of Fame. “They were a real group of hard-working girls, they had good coaches, they honored the game and the way they played it. I was just a coach coming in who was able to put their talent together, it was already there,” said head coach Bill Prahler. The Okemos program produced two U.S. Lacrosse All-Americans, Dudley in 2009 and Mackenzie Lawler in that year, as well as 2010. Those recognitions were followed by six Okemos lacrosse players being named Academic All-Americans, five of them for at least two years: Olivia Hudson, Mallory Flanders, Breanne Stockall, Lawler, Casey Hall, and Betsy VanWiernen. With their performances previously and in those championship seasons, five players rank top 40 on several all-time individual record lists in the MHSAA. Dudley, Lawler, Sarah Lowe, Kristen Hull, and Carly King all appear in the top 10 within several categories at least twice. King appears in the top 10 six times, Dudley and Lawler both appear five times. Hull is the only player with double appearances on more than one list. “It’s really exciting, there’s a lot of hard work that goes into winning those individual awards and I was honored to be recognized, but I think what we were always most proud of was the 64-0 record and the back to back state championships. Those are definitely memories that you hold with you more than those individual awards,” Lawler said. Plaques received for HOF induction. Prahler was inducted, as a coach, into the Okemos Hall in 2013. He is humbled to be inducted again, this time in 2018 with his team. Dudley agreed the moment is very special, and it set them as the precedent for Okemos girls’ lacrosse. Prahler played lacrosse for MSU’s first team in 1963. From there, he started a boys’ club team for Waverly Community Schools. When he retired from teaching, he also attempted to retire from coaching before getting the opportunity to coach women’s lacrosse at MSU. After his time with MSU was finished, he was offered the chance to coach the budding girls’ lacrosse program that made history. The Okemos girls’ lacrosse team began as a club sport, which is separate from varsity sports within the high school. Due to the club not receiving full funding from the school, the team found self-sufficient ways to find the money they needed. Prahler said one of their best fundraisers was selling mulch. While other varsity sports could rely on the athletic department for certain costs, Okemos girls’ lacrosse had to do things on their own. The parents on the team were a behind the scenes force and support system. When the team started, they would drive their daughters to tournaments all over Michigan. Dudley praised the parents’ unity in making the team’s experience memorable. Lawler, a member of the back-to-back state championship team and the current head coach of Grand Valley State’s women’s lacrosse team, credited her father, Charles Lawler, for helping the team during its early stages. Before playing a pivotal role for the high school team, he coached the middle school girls club for his daughter. As lacrosse was still making its way across the state of Michigan, there was a style of play that was familiar with the winning teams in the Metro Detroit area. As the Okemos girls began to dominate, their different style of play stumped other teams. Prahler attributed the team’s success on everyone being prepared. Instead of approaching the game with 12 starters, his philosophy was having 17. He compared the team’s substitutions to line changes in a hockey game. As for their legacy, Prahler describes his team as dedicated, driven and fun loving. The girls enjoying what they did is what set them apart from the rest.